Back in February, Tyler Hamilton tested positive for a steroid that he said resulted from DHEA he was taking to deal with his divorce and his mother's recent cancer diagnosis. Informed of the positive in April, Hamilton retired, and pretty much said cycling was less important than getting sane and healthy. Today, the US Anti-Doping Agency handed down an 8-year ban that should ensure that Hamilton won't, Vinokourov-like, decide to “un-retire.” Hamilton continues to maintain that he didn't blood dope, despite two positive tests in 2004. Hamilton endeared himself to fans through tough rides, like his epic Stage 16 Tour win in 2005 while riding with a broken collarbone. Faced with blood doping charges, Hamilton mounted a defense that taught us all about chimeric twins, and kept his 2004 Olympic gold in the time trial when officials couldn't test his B-sample to confirm A-sample's positive. I got a cork from one of the bottles of champagne the podium finishers popped after last year's US Pro Championship. I can't say for certain that it was Tyler's, but I like to think it was. I was torn by Hamilton's victory in Greenville, because it seemed so superhuman, the way he essentially rode a pack that included 3 Garmin-Chipotle riders right off his wheel. On the one hand, I wanted to believe that this tough kid from Marblehead (how perfect!) had come back from his ban, and was riding like a man out to prove something. On the other hand, how could he have been so insanely strong if he was clean? Some days I thought I was keeping that cork to commemorate that heroic ride; others I thought it was a cautionary cork: Resist the yearning for mythic heroes. Some things are too good to be true. Tyler, you may have been a fraud, but you were never boring. I hope you can find a little peace and happiness in your new life. Vinokourov, now 36 himself, learned today that, even if a team might consider signing and starting him, he is not eligible to ride in this year's Tour. His ban, resulting from a blood doping positive during the 2007 Tour, was set at one year by the Kazakhstan cycling federation, but the UCI stepped in when Vinokourov announced a comeback and the Court of Arbitration for Sport agreed, extending the ban to two years. The 2008 US Pro Cycling championships are this weekend in Greenville, and organizers have made a few changes I think will improve the fan experience. I've been to each of the Greenville championships, and had a great time at each -- if you're in the Southeast or mid-Atlantic, you should definitely consider the drive. 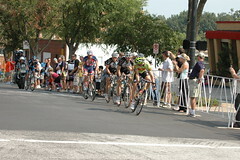 In 2005, the time trial championship (Dave Zabriskie's first title) was run on Friday, with the road race on Sunday. This had the advantage of a rest day between hard efforts for the riders, but the Friday TT drew crowds on par with a neighborhood swim meet. Last year, organizers switched to a Saturday/Sunday alignment, which is probably best for fans (I might argue for Saturday/Monday, which would fill more Greenville hotel rooms and give riders trying to double a rest day). The TT course was a modified point-to-point, so there were only a few points on the course where you could see riders more than once. Additionally, access to the finish line was somewhat controlled by the community that hosted the finish, which ran satellite parking with shuttle buses to the finish. This year, time trial action moves to Clemson University's International Center for Automotive Research, where the 20.7-mile course is 3 laps of 6.9 miles. Because of looping and turnarounds, there will be spots on the course where you'll be able to see each rider 6 times, and parking and course access are reportedly far more open. For Sunday's road race, organizers didn't monkey much with a successful formula, again bridging early and late laps of downtown Greenville with 4 longer loops that include the race-making climb of Paris Mountain. Unfortunately, defending US champ Levi Leipheimer (left, with '07 2nd place Hincapie and 3rd place Neil Shirley) will be across the pond, racing in the Vuelta with Astana. Almost all the other usual suspects are penciled in: Zabriskie, George Hincapie, Christian Vande Velde, Fred Rodriguez, Tyler Hamilton, Tom Danielson, Danny Pate, and more, more, more. Two notable exceptions are Chris Horner and Bobby Julich. I'll be there, as will Byron from Bike Hugger, Briggs from Euro Peloton and James from Bicycle Design. We're planning a meetup at Barley's Taproom Saturday at 5. Look for live-blogging here and on Twitter, and for photos through the weekend in my Flickr photostream. The PdC preview is intensely entertaining -- don't miss it. Rosters for next week's Tour de Georgia are up. Defending champion Janez Brajkovic won't defend his title, while Santiago Botero, Tyler Hamilton, and Oscar Sevilla, held out of the Tour of California, are all listed starters. US fans of the TdF will also have a chance to see Leon Van Bon race in the States. Van Bon won Stage 6 back in 2000, and will lead the “GE Marco Polo Presented by Trek” team, China's first pro team, which also features former Discovery rider Fuyu Li and two other Chinese racers, and one from Malaysia. For more detail, check out my rundown at TdGblog.com, or the official startlist (a PDF). With the race only 5 days away, there's a last-minute switcheroo atop the 2008 Tour de Georgia start list. Saunier Duval-Prodir, which has participated in most (all?) of the Tours de Georgia, has backed out, citing injuries and a need to rest up before the Giro in May. Rock Racing, which was suing to get into the race, now finds a spot open. Whether they'll bring the theatrics, as they did in California, remains to be seen. It seems likely they'll bring Redlands winner Santiago Botero, multiple Tour de Georgia stage winner Freddie Rodriguez, and Tyler Hamilton, who raced here last year for Tinkoff as the wheels began to come off his season. There could be more intrigue to come, as Hamilton, Oscar Sevilla, and Botero were prevented from starting the Tour of California. This post is cross-posted from my Tour de Georgia weblog, but not all TdG posts will be. If you want to follow that race, you should follow that weblog as well. Levi Leipheimer took his first US national championship on Sunday, riding away from the elite field and soloing in from 23 miles out. Leipheimer said the win put the cherry on top of the cherry on top of the sundae that's been his 2007 season, which started with his win at the Tour of California, included road and TT stage wins at the Tour de Georgia, and a stage win and podium placing at the Tour de France, as well as wins at Paris-Nice and the Tour de Georgia and the overall Tour de France title for Leipheimer's Discovery Channel team, which is disbanding after this season. Leipheimer has yet to announce his 2008 plans, but at 34, another go at an overall Tour de France title doesn't seem out of the question. 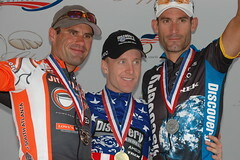 Leipheimer looked to be the dominant rider in the 2006 US championships, as well, but worked for hometown hero George Hincapie. This year, the two reversed places, with Hincapie covering attacks and finishing 2nd. Jittery Joe's rider Neil Shirley distanced Freddie Rodriguez in the last kilometer to take 3rd. Discovery Channel brought twice as many riders as last year, and John Devine and Tony Cruz were at the front of the peloton for most of the day. Where the ProTour riders appeared to nail last year's pace from the start, this year, the domestic teams made early attacks, with BMC, HealthNet, Slipstream, and Successfulliving.com populating the first breakaway of 7 riders. Leipheimer attacked on the 3rd of four long laps that included the climb of Paris Mountain. He and Chris Baldwin swept up remnants of the early break by BMC's Jackson Stewart, Slipstream's Pat McCarty, and HealthNet's Doug Ollerenshaw, with Slipstream's Ian McGregor and William Frischkorn, HealthNet's Roman Kilun, and Successfulliving.com's Daniel Ramsay close behind. On the one hand, Leipheimer was clearly very strong. On the other, 23 miles is a long way to cover with some of the world's best riders trying to reel you in. But Leipheimer's gap hovered out beyond a minute all the way to the end, with Hincapie coming in at 1:11. Tyler Hamilton was 12th at 2:11. Click through any photos for larger versions, or go straight to my Flickr photoset. 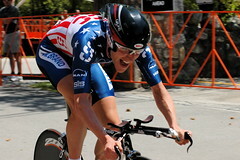 Team CSC's David Zabriskie repeated as US champion in the individual time trial on Saturday. Zabriskie was pushed hard by teammate-to-be Danny Pate of Team Slipstream-Chipotle, just one second slower over the 18.7 mile course. 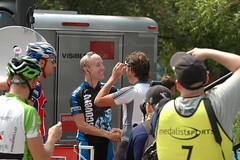 In fact, Team Slipstream '08 owned the podium, as Tim Duggan finished 8 seconds down. Just as last year, Zabriskie raced without an earpiece, and the lack of intermediate splits meant he had to sprint flat-out on the finishing straight to pip Pate. Jonathan Vaughters announced the '08 Team Slipstream squad in Greenville over the weekend, and they're going to have incredible results: Zabriskie, Pate, Duggan, Tom Danielson, Christian Vande Velde, David Millar, Julian Dean, Ryder Hesjedal, Pat McCarty, Will Frischkorn, Christophe Laurent, Jason Donald, Steven Cozza, Trent Lowe, Maartijn Maaskant, perennial TdFblog favorite Magnus Backstedt, Tyler Farrar, Dan Martin, Chris Sutton, Lucas Euser, Huub Duyn, Mike Friedman, and Kilian Patour. Returning to competition was Credit Agricole's Saul Raisin, who has battled back from a devastating head injury suffered in April 2006 at the Circuit de la Sarthe. Starting first, Raisin turned in a creditable 44:07. (Click through either picture to be taken to my Flickr pics of the event). Also back in competition was Tyler Hamilton, wearing a neutral jersey because of an ongoing legal battle with his Tinkoff Credit Systems team, which he claims has tried to change the terms of his 2007 contract in early May, after the season started. Hamilton recorded a 40:23, just a fraction of a second behind Bobby Julich for 6th on the day. Levi Leipheimer and George Hincapie again skipped the TT, prepping for Sunday's road race, which rips through downtown Greenville and makes 4 climbs of Paris Mountain. Some logistical issues meant I didn't make it up to the finish line, and only got pictures from the riders coming down the opening chute. VeloNews, CyclingNews and Daily Peloton all had photographers at the awards ceremony -- links below. The US Pro Championships return to Greenville, South Carolina this weekend. It's a fantastic course in a lovely small-town setting, with a terrific river park less than 300 yards from the finish, sidewalk cafés, barbecue, and top-notch bike racing. Race organizers took half my advice, shifting the little-attended time trial from Friday to Saturday, but left the road race on Sunday, so the likelihood of an already-difficult double national champion seems even a little more remote. For Southeastern fans, though, it means you can see both races for the cost of a single night's hotel room, and still get home for Labor Day. I've always pulled for Levi Leipheimer, but I've never really believed in him. After this year's Tour, I believe. He was the strongest rider in last year's USPro road race, this year's Tour de Georgia, and the strongest American at the Tour de France. He's my favorite to take the Stars and Stripes to his new team, whatever it may be. Last year, I felt Leipheimer's support was critical for George Hincapie, who will look to repeat as US champion and carry the Stars and Stripes to the T-Mobile team as Team Discovery Channel ends its successful run. On the other hand, you can bet Team Slipstream would love to kick off its reign as the top US team with the US title onboard. Danny Pate was 3rd last year, while his teammates packed the top 15. A win for Dave Zabriskie is a win for Slipstream, as he transfers to the Argyles after this season. In the time trial, the course has been slightly altered from last year, getting cut off before the hard right-hander in this photo. Last year, that led up to a twisty last 3 kilometers, where 2005 TT champion Chris Baldwin, neck and neck with Zabriskie, went into a ditch, and lost at least 30 seconds getting back up to steam. If Zabriskie's knee is back in racing shape after his forced withdrawal from this year's Tour, this is his race to lose: Nobody without a funny accent TTs faster than Z.
Dalton, Georgia's Saul Raisin returns to competition, just like he said he would, with a ride in the ITT Saturday. Also expected to return to competition (in both events) is Tyler Hamilton, whose team has kept him from racing since the Tour de Georgia in April. There are 99 riders scheduled to start Sunday's road race. Missing this year? Christian Vande Velde, Freddie Rodriguez, Tom Danielson, Jason McCartney, and Aaron Olson. I'll be there, so look for race updates and photos as soon as I can post them. Alexandre Vinokourov, booted from the Tour after a positive test for blood boosting, has turned to a legal team that has spent the past year studying the sport's dope-testing mechanisms. Maurice Suh and Howard Jacobs are also representing 2006 Tour winner Floyd Landis, awaiting a decision from an appeal of his suspension resulting from a high testosterone-to-epitestosterone measurement after Stage 17 of the '06 Tour. Vinokourov's B sample is being examined at the Chatenay-Malabry lab, formerly the LNDD. Jacobs also represented Tyler Hamilton, who was accused in 2004 of the same thing as Vinokourov: Receiving a blood transfusion to improve athletic performance. Tyler Hamilton and Tinkoff Credit Systems teammate Jorg Jaksche may be barred from riding in the Giro d'Italia, as Grand Tour organizers look to exclude any riders with a link to Operación Puerto. Hamilton's case is particularly difficult, because he has just come off a 2 year suspension for blood doping, but UCI president Pat McQuaid has previously said he believes any involvement in Puerto, even if it dated from before the suspension, should be treated as a second infraction. Grand Tour organizers agreed over the weekend to exclude riders associated with the Spanish investigation, and La Gazetta dello Sport reported on the full 6,000-page investigation file. They claim 49 additional riders (on top of 58 in the June 2006 report) are implicated by the full file. Hamilton didn't ride Liege-Bastogne-Liege, an ASO-sponsored race he won in 2003, over the weekend. “Take my hair if you want. Do whatever you want. For me it's all done. Nobody has ever called me about Operación Puerto. Nobody sent me any questions. People are welcome to call me. I don't know this guy - Spanish doctor Eufemiano Fuentes,” Hamilton said. “I've never met this guy. If somebody has a question, please ask me. Sure they've sent my name out to the press and I've basically gotten railroaded. But they haven't asked for my hair. If you want my hair, take it.” Hamilton then plucked a hair from his head and offered to Sumner. Discovery Channel won 2 races Thursday, as Levi Leipheimer topped CSC's Dave Zabriskie and Health Net's Nathan O'Neill for the stage win, and Janez Brajkovic was the fastest of the riders who made the break on Stage 3. Brajkovic's time was enough to put him in the race leader's jersey in advance of today's climb up Brasstown Bald, but just 12 seconds ahead of Christian Vande Velde of CSC. I've posted 96 pictures from the stage, including shots of Brajkovic, Dave Zabriskie (and at left), David Millar, Tyler Hamilton, and others. 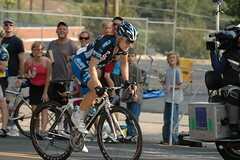 The youngest Discovery Channel rider, Belgium's Gianni Meersman, came out on top after a wild ride into Chattanooga. Discovery Channel, Quick Step, Saunier Duval, and Health Net all put two riders in a 13-rider break that formed about 30 kilometers in. The Tinkoff Credit Systems team, behind race leader Daniele Contrini, was short-handed (because of injuries and the Euro schedule, they brought only 6 riders, and Tyler Hamilton is apparently focused on individual results), and none of the teams with riders in the break would cooperate to chase. As a result, as the break worked through four categorized climbs, the gap went out and out, to 17 minutes, then 21 minutes, about 23 minutes as the break finished the course, and ultimately 29:07 when the peloton arrived. In the break, Saunier Duval's Rubens Bertogliati and Quick Step's Kevin Seeldraeyers were the first to make a move, on the day's last climb. They were quickly reabsorbed, and Health Net's Jeff Louder, CSC's Christian Vandevelde, and Louder again went for victory as 8 survivors streaked through the streets of Chattanooga. In the end, it was Meersman who carried the day, ahead of David Cañada and Janez Brajkovic. Cañada is the immediate beneficiary of the daylong break, taking the leader's jersey, 3 seconds up on 5 riders: teammate Bertogliati, Vandevelde, Brajkovic, Louder, and Seeldraeyers. BMC's Scott Nydam sits another 20 seconds back, with every other rider at least 2 minutes back, and ex-race leader Contrini sitting 14th, 27:47 back. A lot of big names sit even farther back: Tom Danielson, Levi Leipheimer, Gilberto Simoni, David Millar, Dave Zabriskie, and Tyler Hamilton among them. I'm following the race in more detail over at my Tour de Georgia weblog, and have posted a photoset from Tuesday's stage between Thomaston and Rome to Flickr. I'll probably do quick stage wrap-ups here through Sunday's finale in Atlanta. Tyler Hamilton and his Tinkoff Credit System team and David Millar of Prodir-Saunier Duval are two new additions likely to ride in this year's Tour de Georgia. Rider lists aren't confirmed, but it looks like Leipheimer, Hincapie, and Danielson highlight Discovery Channel; Chris Horner, Cadel Evans, and maybe Freddy Rodriguez for Predictor-Lotto; and Dave Zabriskie, Bobby Julich, and Juan José Haedo for CSC. This is a great chance for East Coast fans to see ProTour teams compete, and a great chance for US racers to make a splash against Euro-quality talent. And, of course, the USA Cycling National Development Team. More at my Tour de Georgia weblog. Stefan Schumacher, better known as a classics rider, took over the race lead at Tirreno-Adriatico Sunday with a strong time trial. 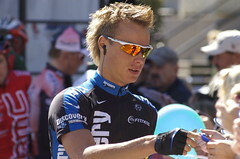 Gerolsteiner's Schumacher rode the 20.5-kilometer (12.7-mile) course in 27:08, one second faster than Astana's Andreas Klöden and six seconds ahead of T-Mobile's Kim Kirchen. It was a great day for former T-Mobiles: Schumacher, Klöden, and 4th-place Astana rider Alexandre Vinokourov all have ridden for the team. Schumacher takes the overall race lead, 3 seconds up on Klöden, and 11 ahead of Vinokourov. Riccardo Riccò, who won both Stage 3 on Friday and Stage 4 Saturday, was well off the pace Sunday, clocking a 29:14 that dropped him back to 17th on GC. Tinkoff's Tyler Hamilton, still reportedly suffering from the flu, finished in 148th on the day, at 4:38. Other Americans: Jason McCartney, 34th at 1:41; Freddie Rodriguez, 142nd at 4:25. 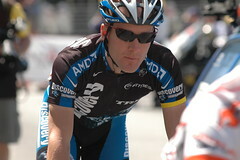 John Bradley of Outside Magazine has an interview with 2004 Olympic TT champion Tyler Hamilton in the March 2007 issue. Outside doesn't post content from the magazine until it comes off the newsstand, but they've posted outtakes from the interview at the link above. I'll try to remember to link to the interview when it's available, as well. So the European racing season kicked off today, with the perfect winner, Jeremy Hunt of the ? and the Mysterians team. Pro wrestling doesn't have such improbable story lines. Telemundo telenovelas don't even have such improbable story lines. I mean, what are the odds that in the very race where Tyler Freaking Hamilton his-own-self came back to the peloton, we would have a team raising questions 2 feet tall? These Unibet.com guys are the perfect poster boys for the pro posse: They just dropped Carlos Quesada, apparently over his possible role in Operacíon Puerto, the scandal that just won't die. Meanwhile, the UCI and the Grand Tours are fighting over who gets to run the races. The UCI wants to add teams to the ProTour, and the Grand Tours want the flexibility to invite some wild cards. The puck getting slapped around by the UCI and the Grand Tours? That's right: Unibet.com. They've been informed that the ASO (organizer of the Tour de France) can't make room for them at Paris-Nice, and that they're not welcome at the Vuelta a España. So today at the GP d'Ouverture La Marseillaise, conflict turned to comedy as race officials told the team they couldn't wear their team jerseys, since they advertise a gambling company beside the French state-run lottery and casinos, in possible violation of French law. This led to the clown costumes that Jeremy Hunt wore to victory today. And let's not even talk about Landis, Ullrich, or Basso. Or Pereiro's (and dozens of others') Therapeutic Use Exemption (TUE). Next up, the Etoile de Besseges. Somebody posted photos from the Tour's 1998 visit to Ireland today. That was, of course, the Tour made infamous by the Festina affair, and eventually won by Marco Pantani. I see a few recognizable faces here, and in shots of the body of the peloton here and here. It would be very cool if you could tag the photo with notes of riders you recognize. Also, does anyone know which stage this is? I think that's Chris Boardman in yellow, which means it's Stage 1 or the beginning of Stage 2, when he crashed out. The pictures are marked as “March 2004”, which is obviously wrong. 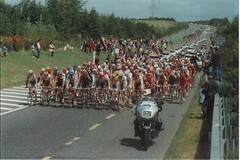 Some help: the 1998 review from letour.fr, including team rosters. Tyler Hamilton has confirmed his contract with Tinkoff Credit Systems. The reigning Olympic time trial champion, banned for 2 years on suspicion of blood boosting, finished his suspension in September. His name was linked to Operación Puerto when Spanish media reported investigators found a doping log for Hamilton in the offices of Eufemiano Fuentes, but as with most other names implicated in the investigation, it appears Hamilton will face no further sanctions. The most notable exception appears to be Jan Ullrich. Swiss anti-doping officials say they'll bring disciplinary action against Ullrich in early January. Among Hamilton's new teammates will be Salvatore Commesso, Daniele Contrini, Danilo Hondo, and Evgeni Petrov. Hamilton told La Gazzetta dello Sport (in Italian) he is considering moving from Girona, Spain, to Calendasco, in northern Italy, where Tinkoff is headquartered. Mancebo to join Hamilton, Ullrich at Tinkoff? At this point, maybe it should just name itself the Operación Puerto squad, but the new Tinkoff Credit Systems team looks likely to sign a top crop of riders, many of whom were named in the Spanish doping investigation. Tinkoff has apparently already signed (but not announced the signing of) Tyler Hamilton. Now they have a 1.2 million euro offer on the table to AG2R's Francisco Mancebo, who said he would hang up his bike after being implicated in the investigation and withdrawn on the eve of the 2006 Tour. Mancebo now has a fallback position if AG2R follows through on Vincent Lavenu's statement that the team will drop him. 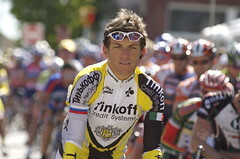 Tinkoff is also reportedly pursuing 1997 Tour winner Jan Ullrich, also named in the investigation. Frankie Andreu and an anonymous US Postal rider from the 1999 squad have told the New York Times they used EPO and other banned substances to help deliver Lance Armstrong's first Tour victory. Andreu was already off the Armstrong Christmas card list after his wife testified last year that Armstrong told his cancer doctors he had used performance enhancers. If you put a gun to my head, I would speculate about Source No. 2, who “did not want to jeopardize his job in cycling” -- I don't think it's Tyler Hamilton or George Hincapie. Both riders said they never saw Armstrong take anything illegal, but Andreu saw him sorting white pills before a race, which Armstrong said were caffeine. To me, on the other hand, the story makes Betsy Andreu's apparent enmity toward Armstrong more, rather than less, understandable, if it's true. Betsy Andreu said she grudgingly watched her husband help Armstrong traverse the mountains at the Tour that year. Later, she said, she was angry when her husband said he had once allowed a team doctor to inject him with an unidentified substance. “It was for Lance,” she said. Stephen Swart, an Armstrong teammate in the Motorola days (pre-1999), also testified in the case, and said he and other Motorola riders discussed EPO in 1995, and that Armstrong thought there was “only one road to take” to compete at the sport's highest level. Sidebar on Andreu specifically, including his recent dismissal from managing the Toyota-United team. If anything I hope that my words help other riders, especially young riders, to not get caught up in doping. We need to make some steps to make things better. If DNA sampling and testing is required then that is the way we should move. I understand the invasion of privacy and no other sport requires this, but if you put the truth out on the table then perhaps something good will come from it. Tyler Hamilton again took the 7.6-mile race up New Hampshire's Mount Washington today, finishing in 52:21. 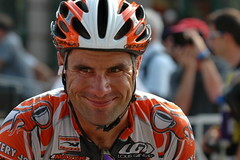 Inaugural mountain bike world champion Ned Overend, now 51, was 2nd in 54:41. Hamilton repeats the victory that's the only entry on his website's palmares page for 2005. The fastest woman was Michigan's Aimee Vasse, whose 1:08:31 placed her 22nd out of 600 competitors. She was trailed by only 6 seconds by Ottawa's Sue Schlatter. UCI chief Pat McQuaid told VeloNews that Tyler Hamilton could face a lifetime ban if claims that he was a client of a sports doping ring in Madrid are proven. McQuaid also maintains that Hamilton can't return from his suspension in September, because his punishment wasn't finalzed until 2005, when the ProTour doping rules took effect, stacking a two-year World Anti-Doping Agency suspension and a two-year UCI suspension, effectively keeping riders out of the sport for 4 years. The UCI expects to see the full 500-page Spanish Civil Guard report on Monday, but the UCI, the Amaury Sport Organisation, which sponsors the Tour, and the involved teams have all seen an executive summary outlining key evidence against riders. Spanish radio network Cadena Ser reports that both Tour de France favorites are named in the Operación Puerto evidence files, unsealed by a Spanish judge today. Phonak riders José Enrique Gutierrez and Santiago Botero, withheld by the team from competition until the case was cleared up, and former Phonak rider Tyler Hamilton are also listed. Roberto Heras, suspended from Liberty Seguros (now Astaná-Würth), and AG2R's Francisco Mancebo, have also been named, with about 50 other athletes (not all cyclists) likely to follow as the press gets the evidence files. Tour organizers had pressed for the names of implicated riders to be released. Now they may be wishing they hadn't. The story at El Pais (in Spanish) doesn't mention Basso, but adds T-Mobile's Oscar Sevilla, suspended Phonak rider Santago Perez, Astaná-Würth's Joseba Beloki, Angel Edo and Quiquie Gutierrez (?). De Telegraaf claims that Rabobank's Juan Antonio Flecha and Denis Menchov (in Dutch) are also named in the 500 page report. Tyler Hamilton can keep his 2004 Olympic gold medal, after the Court of Arbitration for Sport ruled today that the Russian Olympic Committee and Viatcheslav Ekimov have “no standing to file an appeal with CAS” because Ekimov is not “the athlete who is the subject of the decision being appeled from” or the IOC, the UCI, or WADA. 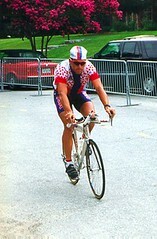 Ekimov was 2nd in the Athens Olympic time trial. Hamilton among Operación Puerto names? Velochimp translates and amplifies an article from Tuttobiciweb.com (in Italian), itself a translation of a story from El Pais (in Spanish), that claims to document Tyler Hamilton's 2003 doping schedule, with a bill for products and services (43,500 euros in all). According to the El Pais article, Hamilton used EPO daily for a few days in late 2002, then every other day until January 9th. On the 14th, time for a blood donation, saved for later use, then anabolic steroids starting January 24th. In March, Tyler was to ramp up HMG use as he tapered the anabolic steroids. If the documents are genuine, Hamilton took Liege-Bastogne-Liege and then the Tour of Romandy 6 days to 2 weeks after a transfusion. Hamilton then went back on EPO and steroids for May, in preparation for his 2003 Tour de France, when he broke his collarbone and took an epic, if tarnished, Stage 16 victory. The Phonak cycling team will become a little more American next season. 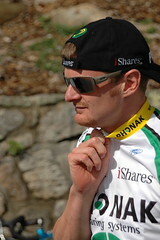 A new sponsor, iShares, will take over title sponsorship as hearing aid manufacturer Phonak steps aside after 7 years. Phonak was unhappy with a string of positive drug or dope tests on the team, notably Tyler Hamilton's positive at the Vuelta in 2004. That would explain the shades. Landis's local paper does a nice writeup of the World's Fastest Mennonite as he readies for the Tour. There's a report out of Spain that Liberty Seguros DS Manolo Saiz was arrested today in Madrid, along with team doctor Eufemiano Fuentes, in connection to a doping case. At least three others have reportedly been detained, and the investigation apparently centers on blood boosting, the process of extracting blood for later transfusion to riders, boosting their red cell count to as near the 50 percent UCI hematocrit limit as possible. Saiz formerly led Team ONCE, the Spanish powerhouse. Jesus Manzano, formerly of Kelme, in 2004 told Spanish daily AS that blood boosting was widespread, and often involved transfusing one rider's blood into another rider. Phonak's Tyler Hamilton and Santiago Perez have both since been suspended for having traces of another person's blood in samples they provided. Liberty Seguros lost Roberto Heras to a positive EPO test during last year's Vuelta, and are expected to be led at this year's Tour by Alexandre Vinokourov. No riders have yet been named in the investigation. Biking blogs coast-to-coast have been up in arms that UCI muscled up on USA Cycling, which notified member clubs that no suspended rider is to appear in an unsanctioned event. The reason: suspended Tyler Hamilton has been sponsoring (through the Tyler Hamilton Foundation) and racing (with photos) in a local race series that's been going on for more than 10 years. Since it's an unsanctioned event, however, USA Cycling has no real authority over the race. They can, however, take action against the suspended cyclist, and others who race with him, and reminded racing clubs that riders could be suspended 1 month per unsanctioned event. NO, the Stazio crit series is a practice series. They will take any invalid liscense (sic). No upgrade points are avaliable, prizes are minimal but so are entries. Its a practice race. Its not UCI, USCF or even local ACA. In fact, its a benifit (sic) race. 5$ per racer goes to the TH foundation. Tyler may be a doper but he's at least turning this break in his career into an oppritunity (sic) to help the community. Hamilton's gotten a lot of support on his website's forum, with many people saying USA Cycling should grant an exemption since Stazio is a charity ride (money goes back to the THF). Others can't believe that participants shared photos with cyclingnews.com. At least one set of photos (Google cache) from the race has been marked private at Flickr. The organizers of this particular event though did indeed thumb their noses at all of the anti-doping regulations by letting Tyler compete. This whole thing probably would not have happened if they had shown some respect for the anti-doping cause in general. Apparently, Hamilton and USA Cycling have come to an informal arrangement that Hamilton won't race in unsanctioned events, and USA Cycling will continue to ignore the possible participation of other licensed riders in this and other similar events. rec.bicycles.racing | Les Earnest, HELP! It's pretty anticlimactic, but Tyler Hamilton received word today that his 2-year suspension from racing has been upheld. Hamilton was the first rider implicated by a new blood-doping test, and he has fought the suspension and the test since his blood test results turned up positive in September 2004. His original suspension date was in April 2005, but the CAS ruled that Hamilton voluntarily accepted a suspension when he withdrew from the Vuelta upon being notified of the positive blood test, so he can return to racing in late September of this year. Still on the table is an appeal by the Russian cycling federation, which wants to see Hamilton stripped of his 2004 Olympic gold, and Viatcheslav Ekimov, currently the silver medalist, elevated to gold. Tyler Hamilton's appeal hearing proceeded as expected today, at the Brown Palace hotel in Denver. Outside the hearing, Hamilton refused comment, except to maintain his innocence of the blood doping charge that led to his 2-year suspension. Looking for a summary? The New York Times did a pretty good overview of the test and its possible issues back in May 2005. In short, Hamilton was found to have someone else's blood in his bloodstream, a result confirmed by his 'B' sample and made doubly suspicious in light of the only other positive test so far: Hamilton's teammate Santiago Perez. Hamilton's defense has suggested that Hamilton might have had a chimeric twin in utero, and that some small amount of the twin's blood might continue to show up on blood test even today. Doping enforcers point out that the test has been used for many years in obstetrics, and that even Hamilton's defense team doesn't deny the presence of someone else's blood cells. By the way, "Wired to Win: Surviving the Tour de France" is making the rounds. Before Hamilton's suspension, the movie, tentatively called "Brainpower", was to follow Hamilton through the 2003 Tour, and teach about the human body and brain while doing it. After the fall, filmmakers changed course, and Baden Cooke and Jimmy Casper get most of the screen time. Tuesday is D-Day for Tyler Hamilton. His appeal to the Court of Arbitration for Sport will be heard in Denver, giving Hamilton a final chance to come up with something more convincing than the chimeric twin defense. A big part of me really wants to be convinced that he's innocent. So far, all his team has shown me is that the test is pretty imprecise, and that it would probably be fairer to establish some minimum baseline below which riders would not be banned from competition. Tyler Hamilton's hearing with the UCI has finally been definitively scheduled for September 6. Hamilton will try to convince a panel that the blood doping test which implicated him at the Vuelta, and potentially at the 2004 Olympics (without the confirming 'B' sample, his guilt couldn't be definitively established) is badly flawed and should at the very least include a threshold value below which athletes would be cleared for competition. HBO: Real Sports with Bryant Gumbel | Tyler Hamilton: Tainted or Untainted? Bryant Gumbel's show on HBO will be looking at the Tyler hamilton case. Correspondent Frank Deford will talk to Hamilton, and consider the fairness of dope testing methods. The episode, the 100th for the Gumbel sports interview and talk show, premieres tomorrow night at 9 p.m. Eastern. Since it's on HBO, you have more than 20 chances to catch it. Assuming you have HBO. As it did last year, the Tyler Hamilton Foundation is sponsoring a nationwide viewing party for one Tour stage, this Saturday's Stage 14. This press release lists all locations. Tickets are $20, with a portion earmarked to the Tyler Hamilton Foundation, fighting MS, and the Davis Phinney Foundation, fighting Parkinson's. Hamilton himself will be hosting a fundraiser at one theater in Lakewood, Colorado, where participants will also have a breakfast and bike ride with Tyler Hamilton, believe him or not. At that location, it's $75, or $50 without the bike ride. Last year, many of the locations sold out, so if it's something you want to do, you should check out the link above to grab your tickets. Today's VeloNews EuroFile column notes that CSC's Christian Vande Velde is in Girona, recovering from his spring campaign, and will focus next on the Vuelta a España. Vande Velde rode both the Giro and the Dauphiné, which were almost back to back. VeloNews also notes that Tom Danielson's next race will be the Tour of Austria July 4-10 (during the Tour). 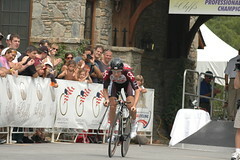 Danielson will face his first full grand tour at the 2005 Vuelta. "In my opinion, legally, they can't judge against him, knowing what I know, without being a political person, just looking at the legal side," Rihs said. "His verdict is very political in my opinion and CAS is more objective." Liberty Seguros' Isidro Nozal (not to be confused with Discovery's Benjamin Noval) and Lampre's Scotto D'Abusco have been DQ'ed from the Dauphiné after testing too high on their prerace hematocrit levels. Officially, the riders are banned from racing for 15 days, but no presumption of doping can be made. Liberty Seguros, however, includes a clause removing riders from the team on any positive, so Nozal will be undergoing additional UCI tests to determine the cause of his high hematocrit. Tyler Hamilton is taking his appeal all the way to the top, the Court of Arbitration for Sport, which could shorten his 2-year suspension if they go for the whole chimera defense. Potentially giving Hamilton a little hope is the case of Danilo Hondo, who this week had his ban reduced to 1 year with a four-year probation. He can come back in April 2006, after testing positive for stimulants in March. Quick Step's Marc Lotz was forced off the team when a local investigation turned up a dealer of anabolic steroids and growth hormone, and evidence that Lotz was a client. 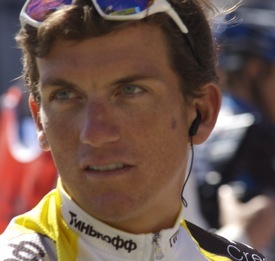 A search of Lotz's home reportedly turned up EPO and other banned substances. nytimes.com (free reg. required) | Cheating, or an Early Mingling of the Blood? New York Times health and fitness reporter Gina Kolata talks to some researchers who lend at least some credence to Tyler Hamilton's defense, and interviews the MIT professor, David Housman, who assisted in Hamilton's defense. Housman, a molecular biology professor, believes that chimerism could cause a person to produce non-matching red blood cells off and on through their life, which could possibly account for the inconsistencies in Hamilton's blood tests through the 2004 season. He also professes doubt that the test is sufficiently reliable. A Seattle hematologic oncologist, who routinely performs flow cytometer measurements, called the test "quite finicky from experiment to experiment." Kolata also talks to Ross Brown, the Australian scientist who helped develop the test in question, and defended the test in Hamilton's hearing before the US Anti-Doping Agency. Brown admitted that chimerism is a possibility, but that in 20,000 samples, he had never seen a convincing sign of a chimera in blood. But Dr. Ann Reed of the Mayo Clinic says that 50 to 70 percent of healthy people are actually surviving twins of chimera. Rather than blood testing, she tests against DNA. Her opinion explains somewhat more fully why Hamilton and his advisers wanted to do DNA testing on the tested samples. Reed also suggested that chimerism might explain some organ rejections that are otherwise unexplained. Kolata wrote a book, Ultimate Fitness: The Quest for Truth about Exercise and Health, that I enjoyed, although I found it a tad unfocused. Unsurprisingly, Tyler Hamilton says he'll take his case up with the international Court of Arbitration for Sport after receiving a two-year suspension yesterday. "The fight's far from over," said Hamilton ... "I'm certainly not a quitter and I'm not going to give up until I'm vindicated," he said. "My chances of racing in this year's Tour de France are slim to none. That's what got me out of bed every morning." Again, if you really want to get into the new test, and the potential for it to be incorrect, you should check out the summary by Jeff Jones at CyclingNews.com. Update: Meanwhile, the Australian Olympic Committee will seek to have Hamilton's gold medal stripped, which would move Australia's Michael Rogers up to the bronze medal (and Viatcheslav Ekimov to gold and Bobby Julich to silver). There's no deus ex machina for Tyler Hamilton: The US Anti-Doping Agency announced this afternoon that it was unmoved by his presentation, and he's been suspended for two years. You can read the decision or the press release through the magic of PDF. Date of the suspension is today, April 18, 2005, to continue through April 17, 2007. Given that Tyler's birthday is March 1, 1971, I don't see him coming back at 36. Interesting to note that there's a lengthy dissent as part of the decision. One of the arbitrators, Chris Campbell, didn't sign on to the decision, and explains why. I may work up another "What we know now" post about the case, but if you're really interested in the case, you owe it to yourself to read Campbell's dissent, pages 14-20 of the decision linked above. Update: Never mind. Just check out the excellent summary by Jeff Jones over at CyclingNews.com. So the LA Times has gotten its hands on some of the documents from Tyler Hamilton's case before the US Anti-Doping Agency. For those joining us late, Tyler Hamilton won the 2004 time trial gold medal, but his blood sample there, and at the Vuelta a España, tested positive for “mixed populations,” or the presence of someone else's red blood cells. His Phonak team dropped him, but he was allowed to keep his gold medal because his "B" sample couldn't be verified. His teammate Santiago Perez was caught by the same test, at the same race, and has been suspended for two years. Hamilton faces the same suspension. Hamilton's test scores were suspicious. On April 24th, at Liege-Bastogne-Liege, Hamilton's “off score”, a formula based on hemoglobin and reticulocytes (immature red blood cells), was 123.8 (The UCI medical director says its riders average about 90). Then at the Tour de Romandie, only five days later, Hamilton's score had jumped to 132.9, doubly suspicious since the limit is 133. Above that, riders aren't allowed to start a race. His hematocrit was just about pegged, as well: 49.7, where 50.0 is an automatic disqualification, although no presumption of doping is attached to either limit. UCI officials pointed out that the two numbers are incompatible: The low number of reticulocytes at LBL means that Hamilton was not producing that many new red blood cells, yet five days later, he had a significantly higher red blood cell count. These results got Hamilton put on the watch list of riders that the UCI monitors more closely. It's worth noting, too, that the UCI didn't perform the test in question on these samples: The homologous blood doping test premiered during the 2004 Tour in July. I would love to know if Hamilton's blood was tested for doping before he dropped out during Stage 13, or if the Olympics were his first test. USADA witness Ross Brown, who co-developed the doping test, said a transfusion or transfusions were the "only reasonable explanation" for Hamilton's test results, and suggested that he had one around the beginning of 2004, another sometime around midyear, and then might have topped up throughout the year. Hamilton's legal attack on the doping test's validity rested on two points: 1) There's no threshold in the test: it only shows the presence, not the amount, of someone else's blood cells, and 2) That it proves only the presence of someone else's blood cells, not of a transfusion, and may be subject to false positives, as the “vanishing twin” argument suggests. The Tugboat defense reappeared, as Haven Hamilton points out to the LA Times reporter that Tyler would never have risked a transfusion after Tugboat's death, which immediately followed a transfusion. Occam's Razor doesn't look to be cutting Tyler's way here. Update: Tyler addresses many of the issues of his case in his latest (April 18, 2005) diary entry. Tyler Hamilton to ride Tour de Georgia? Looks like, even with no racing, Monday's going to be a big day for US cycling. Lance Armstrong will announce, well, something, in Augusta, at the pre-event press conference for the Tour de Georgia. Speculation is that he'll announce that 2005 will be his last shot at the Tour de France, with 2006 focused on the US calendar. Now cyclingnews.com reports that the US Anti-Doping Agency is very likely to counter with a little announcement of their own: The long-awaited results of Tyler Hamilton's appeal of his suspension for blood doping. Hamilton presented his case in the week of February 27th, and reportedly attacked the credibility of the homologous blood doping procedure, which was first used in cycling during the 2004 season. Does the long delay mean the tribunal was swayed by Hamilton's case? The cyclingnews.com story quotes an unnamed but "prominent US rider" that Hamilton is expected to "get off" and to take the start at the Tour de Georgia on Tuesday. Even if the USADA clears Hamilton, the UCI might take separate action, appealing the USADA action to the Court of Arbitration for Sport in Lausanne, Switzerland. Next to go: Hondo or Hamilton? Shouldn't be long now -- results on Danilo Hondo's B sample are expected by week's end. He twice tested positive for Carphedon, a stimulant that increases endurance and cold resistance. By the way, here's a Google search for Carphedon: The Hondo story is the subject of the top 10 links, all in German. About the only link that's not directly sports-related is this journal abstract, which is looking for a urine test for carphedon. Tyler Hamilton still doesn't have the results of his hearing conducted back in February. He, too, is expecting news soon. Procycling reports that the "Spanish Committee for Sporting Discipline" (i.e. the Spanish Inquisition, sports division) turned down Santiago Perez, who had asked that his 2-year ban be suspended until the "viability of the blood doping test has been confirmed." Perez' ex-teammate, Tyler Hamilton, is awaiting results of a hearing before the US Anti-Doping Agency, where he and his attorney made the case against that test. Both Hamilton and Perez tested positive at the 2004 Vuelta a España, and Perez was sentenced to a 2-year suspension last week. Tyler Hamilton wrapped up his arguments with the US Anti-Doping Agency on Wednesday, and should hear within two weeks if he'll face a two-year suspension for blood doping. Hamilton tested positive for "homologous blood transfusions" (i.e. using another person's blood to pack his system with red blood cells) at the Vuelta a España, and officials claimed there were inconsistencies in his sample from the 2004 Olympics, where he won gold in the individual time trial. Hamilton was not stripped of his gold medal, because his "B" sample, normally used to confirm suspect readings, had been frozen, leaving it unusable for the blood doping test. Hamilton's former teammate, Santiago Perez, was banned for two years this week for failing the same test at the 2004 Vuelta. Hamilton and his attorney question the validity of the test itself, which was only added to the UCI's battery in 2004, although it's been used medically during pregnancy and before organ donation for years. 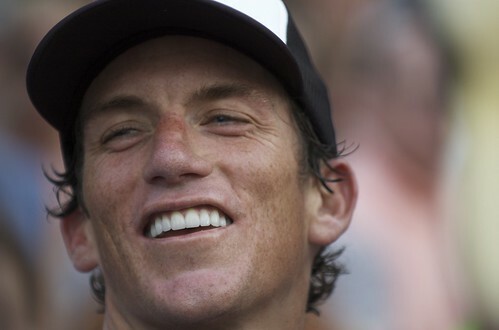 Tyler Hamilton will face the US Anti-Doping Agency starting tomorrow in Denver. Hamilton has maintained his innocence after two positive tests for illegal blood transfusions, and will apparently attack the validity of the test itself, which was first used in cycling last year. "But here the validity of the test has to be established. We've preached all along it's not a valid test. Maybe we know something they don't." The Post also talked to a professor of immunopharmacology, who said the data the test provides are "very accurate. The principles used in cyclists' blood doping cases are very accurate." Outside of sports, the test is used in organ donations. "For sport, it's a brand-new test, and Tyler's the first one coming out allegedly positive," Wilcockson said. "I'm always a bit skeptical of new tests, especially with the degree of scientific analysis with this one." The standard suspension for doping infractions is two years. The long-dormant TylerHamilton.com website has been updated, with news of the successful Phonak appeal, Hamilton's own case, which he said is scheduled to be heard late this month or early next, and the usual personal anecdotes (and pictures of his new puppies). ...as far as I know, the media reports stating that a two-year suspension is on his horizon are incorrect. From what I understand, he did make an unsuccessful appeal to have the case against him thrown out based on how and when he was asked to provide his final blood sample. However, I’m told his case with the Spanish Cycling Federation probably won’t be heard until May or June, which means Santi will most likely be racing for the first half of the year awaiting his hearing. Elsewhere, ProCycling.com reports that the Vuelta doesn't know how it will accommodate Phonak this year. Since they won their appeal, they've become the 20th ProTour team, which should allow them to race in all the UCI races, including all three grand tours. Unfortunately, the Vuelta had held 19 places open for ProTour teams, and intended to offer 2 places to Spanish teams, likely two of Comunitat Valenciana, Relax, and Kaiku. If they add Phonak, it would require taking only one Spanish team, or expanding to 22 total squads, more than organizers believe they can handle logistically. The Court of Arbitration for Sport today ruled for Phonak, which had appealed its exclusion from the new ProTour, levied after Tyler Hamilton, Santiago Perez, and Oscar Camenzind all tested positive for drugs in 2004. Phonak license is limited to two years instead of the customary four. Because all ProTour teams automatically qualify for the three grand Tours, Phonak will participate in the Tour de France, as well. ...the cases of Tyler Hamilton and of Santiago Perez could not constitute, on the date of 12 November 2004, doping cases making the two riders and the Phonak Team liable for doping infractions. Now, Hamilton and Perez have decided to defend themselves in order to try to prove their innocence. While respecting the will of the UCI to be strict in the fight against doping, the CAS arbitrators have considered that it was not possible, at this stage, to remove the Phonak team from the Pro Tour on the sole basis of doping suspicions concerning the two riders and before knowing the outcome of the disciplinary proceedings regarding them. A more cynical man might read Hamilton's long silence as a strategy to leave his (and Santi Perez') guilt in question long enough for the team to get a ProTour license. This is certainly a boost for the world's fastest Mennonite, Floyd Landis, who seems likely to lead the team in one or more grand tours. According to an AFP story this morning, Phonak fired Tyler Hamilton last week, in an attempt to gain a spot in next year's ProTour. UCI officials told the French wire service AFP that Phonak chief Andy Rihs informed them of the decision to fire Hamilton as he unsuccessfully appealed last week to his team included in the 2005 Pro Tour championship. Cycling's international governing body, the UCI, announced its final list of 19 teams for the ProTour, and removed Phonak, AG2R, and Mr.Bookmaker.com from its preliminary list. UCI offered no reason for the exclusions, but in their original list, they cited Phonak's inability to organize the team to combat doping, a reference to the EPO suspension of Oscar Camenzind and blood doping positives for Hamilton and for Santiago Perez. Update: TylerHamilton.com confirms that Tyler is no longer with Phonak. Specifically, it would be impossible for Phonak to be accepted into the UCI Pro Tour with one of its riders facing charges of using prohibited performance enhancing methods. We had hoped my facing the judicial process alone, apart from the team would pave the way for Phonak being included in the Pro Tour. Hamilton still maintains his innocence: "I am more committed than ever to getting to the bottom of all this." Phonak has said that the team might close down if if can't race in the new tour. The team still can appeal to the Court of Arbitration for Sport. Tyler fires back: "Olympic sample was deemed negative"
In a press release today, Tyler Hamilton has come out swinging against the IOC testing procedures that labeled him positive for blood doping in Athens. Hamilton's statements focus on "things that have been said inaccurately in the media:"
...[M]y A sample from the Olympics, the one that first brought on this issue, was initially determined to be negative for blood doping. When it was re-analyzed -- and I am not sure why it was re-analyzed -- it was again deemed negative. It was not a clearly positive test as it has been characterized. Instead, the results of both negative tests were reviewed by a "panel of experts" and then apparently deemed positive. ...[M]y B sample from the Olympics was not accidentally frozen. I have no idea why an official would lie about this procedure but for the record, the protocol is for the B sample to be frozen when the A sample is negative. This was the case with me after my A Sample was deemed negative and is why the lab froze the B sample, as opposed to a lab "mistake." Hamilton also says the results from Athens and from the Vuelta, where officials say he also tested positive, again for blood doping, "reveal serious inconsistencies, which could mean that 1) the test itself is invalid; 2) the test method was not followed; or 3) that one of the samples is not my blood." Hamilton says his requests to have the blood samples DNA tested, or to have an independent tester review the findings, have all been turned down. Tyler Hamilton's Phonak squad will make its case to the UCI next week, in hopes of reversing the body's decision to exclude Phonak from the new ProTour in 2005. Although UCI gave no reason for its decision, Phonak said it was related to doping. Phonak added in a statement they would put their case to the licensing commission on November 22 and a final decision would be made on December 2. "The reason for the licence not being granted in the first instance is the ongoing clarification relating to the internal medical checks for tightening measures against doping," Switzerland's only cycling team said on Monday.